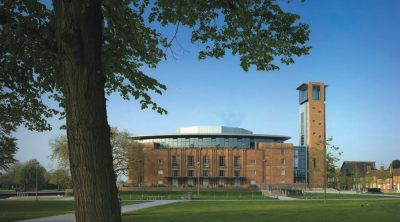 The Royal Shakespeare Theatre opened its doors in November 2010 following a £112.8M renovation. 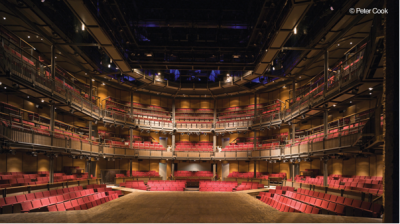 The theatre is one of the most iconic theatrical sites, and the Royal Shakespeare Company (RSC) wanted to create the best theatre in the world to perform and pay homage to Shakespeare plays. The 'Transformation' project called for the retention of the existing theatre facade and foyer and the rebuilding of a larger theatre. This included the creation of a new 1,040+ seat thrust stage auditorium bringing the actors and audiences closer together based on courtyard theatres of the Middle Ages, with the distance of the furthest seat from the stage being reduced from 27m to 15m. Several elements were involved in the overall transformation, including the refurbishment of the existing building and the demolition of the 'picture frame' auditorium which was originally built in the 1930s. 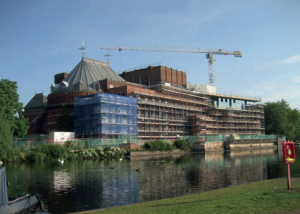 Improvements to the Swan Theatre created an array of new public spaces, including a Riverside Cafe and Rooftop Restaurant, a 36m observation tower and improved backstage conditions. The new theatre was also made more accessible to people with disabilities. The main part of the transformation involved structural steelwork extensions to three areas on the existing building, including the new auditorium and two new wings. This work required the seamless supply and installation of 580 tonnes of structural steelwork, as well as having to be sensitive to the needs of the area and fit comfortably alongside the remaining historic building. The new auditorium sits in between the retained theatre fly tower and the 1930s Grade II listed Scott Foyer. The two main roof trusses span the length of the new auditorium at 24m long x 2.5m deep and weighing 36 tonnes. The trusses needed to be solid and were designed to support 25 tonnes of scenery which is to be suspended from them. They will also support a hanging technical gallery which will be used for lighting and sound equipment, plus two hung floors over the auditorium. The complexity of the theatre brought with it many challenges during the erection phase. The biggest was making the improvements to the existing theatre building where the steel had to be erected in and around the building, with consideration given to the surrounding area and infrastructure. The most challenging element was working around temporary supports which were in place and could not be removed until the solid structure had been connected. Erection of the fabricated new fly tower behind the new stage area, took place on site within a very tight space. While erection of the columns was relatively straightforward, the internal trusses required splicing and lifting into the tower in small sections. This was a time- consuming task that required extra care during erection due to the Grade II listed building classification the theatre has. The building's architectural excellence involved the construction of a new 'thrust stage' main auditorium and remodelling of public and back-of-house spaces, whilst retaining the art deco interiors of the existing foyers. A public square and viewing tower were to be added as part of a master plan to enhance the visitor experience. The 32m high 'lantern' platform, giving visitors panoramic views across Stratford, has been positioned at the top of the theatre's new tower. Steel's lightweight advantage suited the complexity of the project. The efficient design, fabrication and erection allowed the steelwork to connect back to the existing building's retained facade. Overall around 36 tonnes of trusses were erected which were brought to site in three sections and assembled on site before being lifted into place with some complex lifts and manoeuvres. The steel wing structure includes a 10m long Vierendeel truss which connects up the rooftop cafe's canopy. This section weighed 10 tonnes and was brought to site in one piece prior to lifting into position. Another complex part of the erection process was to erect new steelwork walkways to the retained fly tower. Access was very limited and the steel had to be lifted through a 2m x 2m opening in the tower's roof. Throughout the project there was a high degree of communication between the project team to value engineer and accurately produce prototype 3D models that not only drove the seamless installation of steelwork but helped achieve the most exacting of site programmes. The models produced for all areas of the structure in erection sequence helped give project managers and all site operatives a better understanding of the complexities of the steel structure and its integration into and around the existing building. Fire engineering on the building was achieved through a combination of shop applied corrosion primer protection, and intumescent coating to the exposed beams in the foyer. The complete remodelling of this iconic theatre and varied ancillary areas has been exceptionally challenging. The design team, main contractor and steelwork contractors have responded well to the evolving demands of the scheme. The steelwork has been key to dealing with the varied major areas, with interesting interactions of structural materials. The breadth and popularity of the theatre's activities illustrate the success of this complex project.